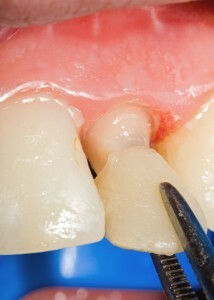 Temporary crown for toothTemporaries are acrylic or composite veneers that are placed on the prepared teeth for protection during the time the porcelain veneers are constructed in the lab. A temporary serves several important purposes: it protects the exposed dentin to minimize sensitivity, prevents the tooth from shifting, and last but not least, restores tooth contour and appearance. The temporary is placed with cement that is designed to come off easily so avoid chewing sticky foods such as gum or taffy. 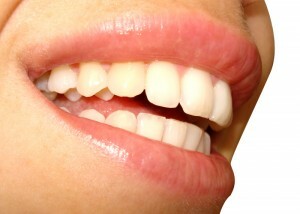 Use your toothbrush to clean the temporary as you normally do your natural teeth. You may also floss or, if there is more than one veneer and the temporaries are fused, you may need a floss threader. To avoid loosening the temporary, it is best to pull the floss through the contact rather than pulling it down through the contact.